The word paper comes from ‘Papyrus’, an Egyptian word that originally meant “that which belongs to the house”. Egyptian Papyrus was very helpful and revolutionized their ways of communication. The first use of papyrus paper is believed to have been in 4000 BC during the 1st dynasty. It was continued to be used until about the 11th century AD. Papyrus was discovered by Egyptians in their quest to find out an efficient and easy means of communication. Papyrus was found to be strong, durable and easy to carry. Egyptian Papyrus is made from a plant that grows on the banks of the Nile River in Egypt. The aquatic plant, Cyperus papyrus, grows up to 15 feet. Its green, triangular stem has long, sharp leaves and flower clusters up to 20 inches. Papyrus is made from the stem of this plant. The stem was also used for making boats, rope, and baskets. As widely believed, Papyrus was not only used as a writing instrument, It was also used for mattresses on beds, for building chairs as well as for tables, mats, baskets, sandals, utensils, rope and boats. Furthermore, the papyrus root was a source of food, medicine, and perfume. Papyrus was one of Egypt’s chief exports. But it did not survive for a long time because only the dry climate of Egypt was conducive to its preservation. Papyrus with writing on it is known as papyri. The climate of Egypt preserved papyri in the ruins of ancient towns and cemeteries. The process of papyrus making is as follows. For practical purposes, the papyrus was limited to a standard size running 47 cm in length at the most, and 22 cm in width. In the first place, the outside layer of the stem was removed. The inner layer of the plant was sliced into long strips and placed side by side with a second layer on top at a right angle. Then the whole thing was soaked in water and pressed under a heavy rock for 21 days. The juice of the plant acted like glue and bonded the strips together. The outcome was a sheet, which was hammered flat and dried in the sun. The process differed slightly in different periods of Egyptian history, but the essence was almost the same. For longer documents, the pages were joined to create a papyrus roll. In fact, papyrus sheets were usually not sold individually, but in rolls. There were also Papyrus books called codex, in later periods.Each type of Papyrus was used for different purposes. Very cheaply made coarse papyrus was used by merchants to wrap items. The finest and most expensive varieties were reserved for religious or literary works. The finest papyrus was made using the innermost pith layers and was said to have come from the Delta region. The various varieties and sizes of papyrus were often named in honor of emperors or officials. 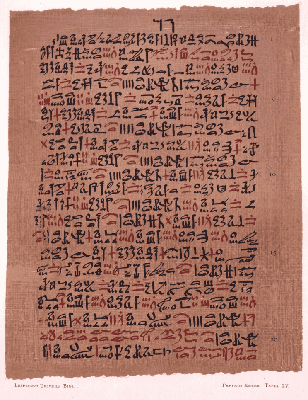 The ancient subject matter recorded on papyrus can be extremely varied and can include literature, religious texts, magical texts and even instrumental music. Production of Papyrus paper and cultivation of papyrus plantations were neglected after the invention of paper and papyrus actually disappeared from the Egyptian landscape.